As a seafood and nature lover,the Gulf coast Oil spill's dire consequences immensely concerns me.When Foodbuzz announced the 24x24 Gulf Ambassador event dedicated towards raising money for those affected by the Gulf oil spill.I could not possibly miss the opportunity to support the rebuilding efforts and promptly proposed a Gulf inspired meal titled "Save the Coast - A Louisiana Seafood Celebration".Apparently Mr.Healthnut and I were in planning of a get together.It has been a year since we moved to Columbus and was about time we socialized with our new acquaintances.With my proposal accepted and my amiable pals available to join in the seafood feast,here is how I proceeded to prepare and execute the memorable dinner. Normally I would start the preparation for a party(like this one) at least 3 days ahead.But it was different with seafood which tastes best the same day as cooked.The only prep work the day before was to have all the ingredients in hand. Since my friends share the same love for spicy seafood ,the main ingredients were exclusively seafood.I choose affordable simple kind - crab,shrimp and fish,since we wanted this to be a budget friendly meal.Inspired by traditional Louisiana cuisine,each of the courses had to be flavorful but not overwhelmingly spicy as the weather was already turning up the heat. All the seafood was bought from the local markets of Columbus that sell the best quality seafood.Some of the fresh herbs(thyme and cilantro)and vegetables(tomatoes and okra)were from my home garden(yes,harvested from my first ever home garden). To get the festivity rolling,these bite-size crab cakes were an appetizing start.The sauteed vegetables are mixed with crab meat,fresh and dried herbs ,spices and cooked to a slight crunch.These were gone in no time,so the first course of the meal had to be served promptly. Heat about 2 teaspoon of oil in large pan,cook the onions, bell pepper, and celery ,until softened, about 8 minutes.Cool. 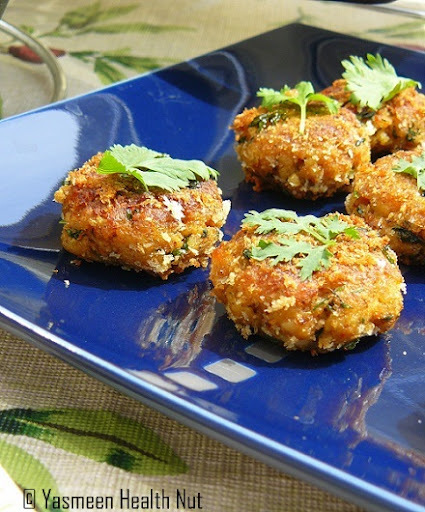 Whisk together the egg ,worcestershire sauce ,ginger,cayenne and salt in a large bowl, mix in the crab meat,cooked onion mixed and 1/2 cup bread crumbs.Shape into bite size patties.Dredge the patties in remaining bread crumbs. Heat the oil in a large non-stick or cast iron pan over medium heat. When oil is hot, carefully place crab cakes, in batches, and fry until browned, about 3 to 4 minutes on each side.Serve warm with tartar sauce. Gumbo is a luscious flavorsome soups savored in the Louisiana cooking.The stew is thickened with the roux sauce(made with equal portion of fat and flour),the mellow okra,spices and finally a variety of seafood are cooked slowly until the seasons marry.Usually enjoyed over bowl of white rice,I served with a more exciting jalapeno corn bread instead.I seeded the jalapenos again to avoid the excess heat.The buttermilk not just balances the heat but also makes the bread really moist. Usually a soup and bread like such would make my meal complete,but as this was feast on grand scale,I was glad the guest were waiting for more. In a large cast iron Dutch oven or pot add the oil and flour.Cook over medium-low heat ,stirring constantly until the roux is lightly brown and aromatic,about 30 minutes.Add onions, peppers, celery and garlic. Saute for 4-5 minutes,add the tomatoes ,cayenne and bay leaves,cook for 2-3 minutes before stirring in the water.Cover and bring to a slow boil.Add the okra and simmer for 10-15 minutes until softened.Now add the shrimp and simmer another 15 minutes.Serve warm with the corn bread. Preheat oven to 375 degrees F.In a large mixing bowl, whisk together the eggs ,and add the buttermilk and baking soda, and whisk to combine. Add the flour, cornmeal, peppers, and salt. Using a spatula stir until just blended. Do not over mix. Pour batter into a greased 8 inch cast iron pan or a square baking pan or a baking dish. Bake for 25-30 minutes, until a toothpick inserted in the center comes out clean. 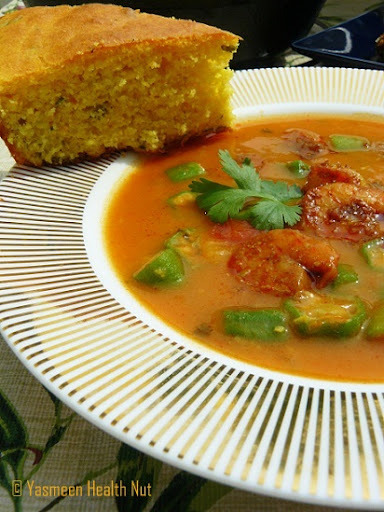 Let cool few minutes before slicing.Serve warm with the Okra shrimp gumbo. 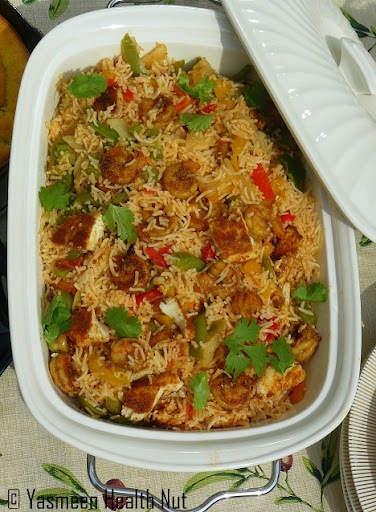 Jambalaya is another one of the most celebrated food in the Southern cuisine,prepared with variety of meat,spices and rice.I kept mine strictly seafood,the Cajun style has no tomatoes,the spice rubbed seafood is browned for the extra smoky aroma then cooked with rice and vegetables. Last and fulfilling end of the savory course,the only craving now was for the dessert. fresh cilantro or parsley for garnish. In a small bowl,mix together all of the ingredients under the seasoning list.Rub about a tablespoon of the seasoning over the fish fillet and shrimp.Let marinate in fridge for 10-15 minutes. Meanwhile heat oil in a dutch oven or skillet on medium-high heat,add the onion,pepper and celery,saute to 3-4 minutes until soft,add the garlic and a tablespoon of the cajun seasoning and cook 2-3 minutes,get the vegetables out of the pan. Add the fish fillets ,one at a time in to the pan and cook 5-6 minutes on each side until spice on the crust is nicely browned,take the fish out and cook the shrimp for 4-5 minutes until spices is brown and aromatic.Set the shrimp aside along with the fish.Now add the rice in to the pan ,stir frequently,cook 3-4 minutes until rice is pearly white,then pour in the stock and drop the bay leaf;bring to a boil.Cover,reduce heat and simmer for 10-12 minutes.Then mix in the vegetable mixture,fish fillet(torn in smaller chunks) and shrimp,cook another 10 minutes until rice is fully cooked.Discard the bay leaves.Serve warm.Garnish with fresh parsley or cilantro. 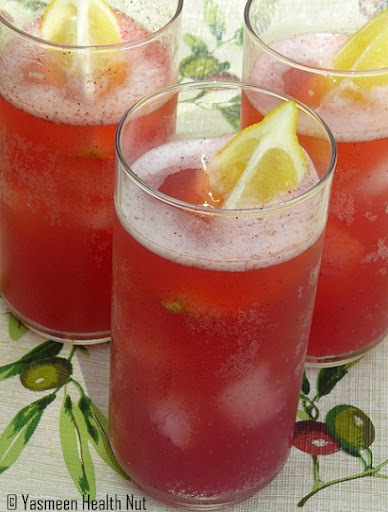 A refreshing blend of berries and lemons,the chilled drink was a perfect thirst quencher. 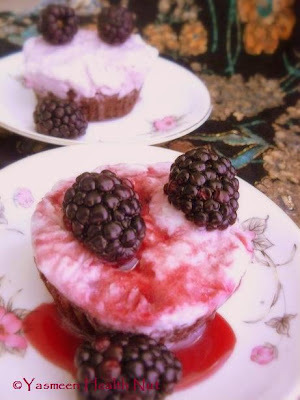 Puree the frozen berries in a blender with the sugar until smooth.Filter the puree to remove the pulp.Pour about 2 tablespoon of the berry juice in each glass.Add the ice cubes,soda water,a lemon wedge in each and serve immediately. 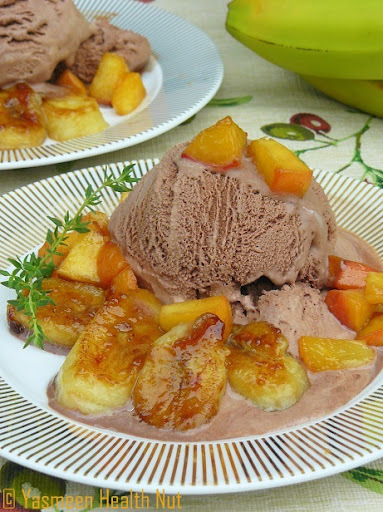 For a sweet finish to the enticing feast,nothing could have been more cooling than an ice cream dessert.Quick to put together with simple ingredients, caramelized fruit and ice cream,this is the kind of dessert one can prepare right in front of the guests of the party.My version is non-alcoholic,for added flavor I infused the caramel sauce with fresh thyme. Melt the butter or coconut oil in a pan on low heat. Add brown sugar, cinnamon and nutmeg and stir until sugar dissolves. Add the orange juice,thyme and bring sauce to simmer. Add peaches ,bananas and cook for about a minute ,sprinkle the zest and turn the heat off. Discard the thyme sprigs,place the fruit in the serving plates,pour some sauce over each,and serve with the ice cream. As much as we loved the succulent seafood meal ,we were also very anxious about the extent of damage the spill has caused to the marine and wild life in the Gulf not to mention the fishermen whose livelihood depend on the business,and how it would affect some of our seafood choices in years to come until natural purity of coastal waters is restored. Foodbuzz has pledged to donate $250 on behalf of every featured 24x24 publisher of the month, to Greater New Orleans foundation,which has been playing a key role in relief efforts in the wake of the tragic oil spill.I am truly pleased to have been selected as the Foodbuzz 24x24 Gulf Ambassador. Be sure to check back with other 24X24 posts of this month here. very well done yasmeen......congrats....those meals look finger licking good! Congrats! this is a great seafood meal,bet the guests had a wonderful time. I am sort of in shock right now because you made more in one meal than I do all week. And everything looks SO good. 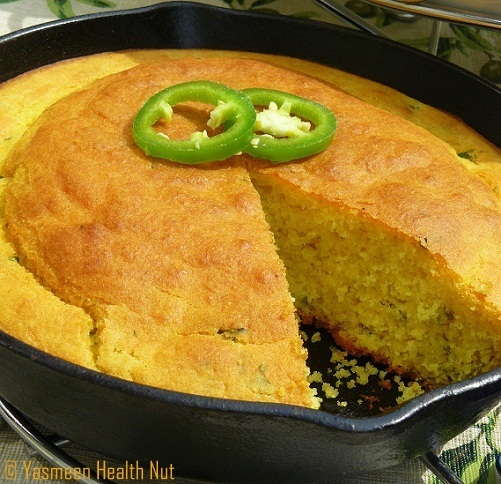 I would definitely eat that cornbread in a second - and there are few things that contain gluten that are worth the risk of a stomach ache to me! But the cornbread definitely is. Wow, that is one fabulous meal! Southern food is awesome. So comforting and flavorful! I am crazy about shrimp,cannot imagine the prices going up cause of the spill.Good job raising the money for the disaster relief. Tasty tasty seafood.I was not paying much attention to the effects of the oil spill,I'll be following the link and check If I could be of any help. You must be proud of creating such an entertaining meal. That is a fabulous spread!! Way to go! Hats off! a great meal for a worthy cause. This is an appetizing and complacent southern meal. 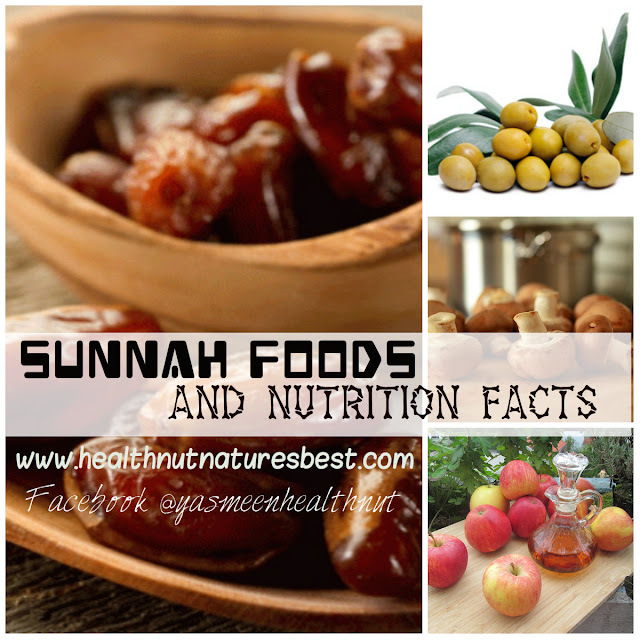 Great post Yasmeen. Wow, congrats, I am vegetarian so I loved your corn bread and of course all your pics! !, I think the guests had a wonderful dig in their!!! That bananas foster looks amazing! I just found your blog and subscribed! Yasmeen...your passion and dedication has certainly shined in this amazing prepared spread. I'm not necessarily a fan of spicy food, however, I could see myself enjoying a lot of what you made. Thats a wonderful meal.. Pretty sure that ur guests wud have enjoyed it well.. There is an award awaiting for you in my blog. Please drop by and collect it :) Many many congratulations !!! I enjoyed reading your post, every dish you prepared looked delicious and the menu was over the top fantastic! Beautifully photographed and very well written, thanks for sharing! 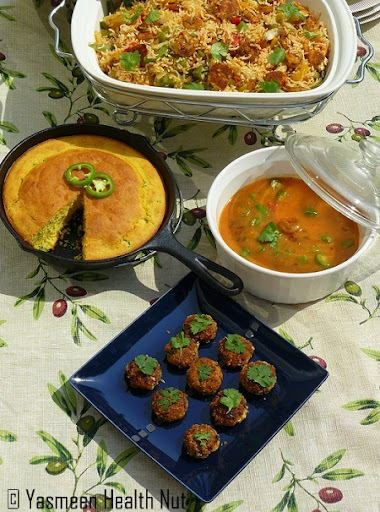 what a fabulous looking meal.. book marked your corn bread recipe ..
the menu sounds delicious! great job! You have put together a wonderful meal here.I'm truly going to miss the fresh catch of gulf seafood. 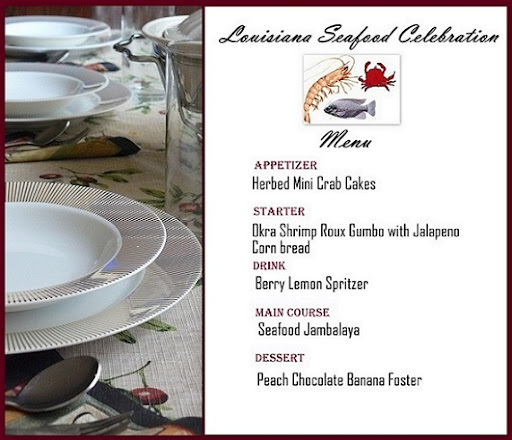 I like the use of succulent seafood in the meal.The velvety gumbo would be my personal favorite. Everything looks delicious, especially the seafood jambalaya. ooooooooh....so many good looking dishes....all for a cause , great!! i am going to try that corn bread and the dessert very soon . What a spread!! Everything looks amazing, Yasmeen. 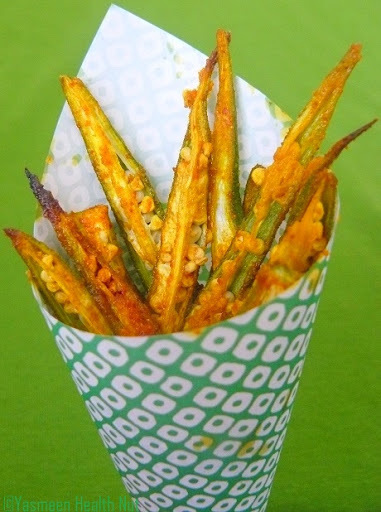 I would be particularly interested to try the jalapeno cornbread! Wow mouth watering food. I love the menu. great job yasmeen.